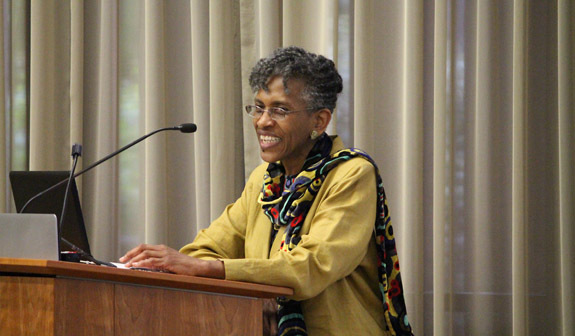 Political scientist Pearl T. Robinson describes the work of Mama Kiota as a vital part of the global feminist movement. A female Sufi educational and spiritual leader, Mama Kiota has been working under the radar in her local community in Niger for 40 years, educating and empowering rural African Muslim women. What Mama Kiota has done with Jamiyat Nassirat Din, said Robinson, is to craft a series of institutional responses to the rejection of secular legal reform in Niger by Islamic associations. International Institute, May 30, 2013 — At the Annual James S. Coleman Memorial Lecture of the UCLA African Studies Center on May 21, 2013, political scientist Pearl T. Robinson described the work of Mama Kiota (pronounced “cho' tah) of Niger as a vital part of the global feminist movement. Mama Kiota is a Sufi woman who is an educational and spiritual leader in the Tijaniyya Sufi order; her work encourages women’s empowerment within Islam in rural Niger. Born in Sénégal, she is the daughter of Cheïkh Ibrahim Niasse (1900–1975) — arguably, said Robinson, the most important Sufi Muslim scholar of the twentieth century in West Africa. She moved to Niger in 1960 to become the fourth wife of Sufi Cheïkh Aboubacar Hassoumi of Kiota (1914–2004) in a political marriage intended to spread her father’s version of Sufism (known as Niassism). For the past four decades, recounted Robinson, this Muslim woman has been working under the radar as a leader in her rural community, educating and empowering rural African women — the concerns of which have rarely figured in international women’s forums. She began by creating numerous schools (from Franco-Arab kindergartens through lycées) and provided women local-language education, which they used to establish a very effective microcredit association. In 1994, she founded an Islamic women’s association, the Jamiyat Nassirat Din (JND), which has grown to become a multiethnic, transnational body with chapters in a few cities as well as the countryside. Robinson said the organization currently has 200,000 women members in Niger and branches in eight other Western African countries. “[Its] members range from adherents with no formal education other than basic Islamic knowledge to university graduates trained in both western and Islamic institutions,” she explained. The speaker pointed out that the female Sufi leader developed a public face only after her husband died in 2004. However, Cheïkh Aboubacar Hassoumi was supportive of her goal of educating women and often spoke to local mothers and his male followers to encourage them to educate their girls. What Mama Kiota has done with Jamiyat Nassirat Din, said Robinson, is to craft a series of institutional responses to the rejection of secular legal reform in Niger by Islamic associations. Starting in 1976, the government of Niger began to develop a family code that would grant women more legal rights in what the speaker claimed was an effort to localize the principles of women’s rights enunciated by the global feminist movement. The code was, however, rejected by Islamic associations in Niger, which claimed it would undermine Islamic law. The parliament subsequently failed to ratify the African Union Protocol on the Rights of Women due to the same objections. Yet these events have not stopped these women from moving ahead with their empowerment agenda, said Robinson. The JND has begun to sponsor a “Congrès” — which the speaker described as a public policy forum — every three years in rural Niger in the context of Sufi rallies. A “Congrès” organized by it in 2003, for example, resulted in 3,000 Nigerien rural Muslim women participating in the development of the World Bank Poverty Reduction Strategy for Niger, looking at what they themselves could do to further this goal, she recounted. The wives of both the president and prime minister of Niger were in attendance. Other “Congrès” have engaged thousands of everyday Nigerien women in discussions of topics such as peace and sustainable development, and reconciliation and solidarity in Islam. Some 5,000 women attended the latter Congrès/rally in 2011, during which the spokesperson for the president of Niger commended Mama Kiota as a leading personality in Niger who promotes peace. Today, Mama Kiota’s daughter, Malama Zahara Cheïkh Aboubacar Kiota, is an accomplished Islamic scholar and a member of the National Islamic Council (Haut Conseil Islamique), to which she recently submitted a document — in Arabic — that outlines an argumentation for family law within Islam. To date, there has been no official reaction to the document from the Council, which Robinson considered a positive outcome. Robinson interpreted Mama Kiota’s work within the framework of the global feminist movement. She argued that although western feminists had been in the vanguard of this movement, catalyzed by the 1975 U.N. Conference on Women in Mexico City (albeit amidst great political disagreement) and three subsequent U.N. conferences, many of its “stars” and leaders today are African women. Women legislators from developing countries, said the speaker, identified the goal of eradicating women’s illiteracy as their first priority at the alternative nongovernmental organization forum that occurred simultaneously with the second U.N. Conference on Women in Copenhagen in 1980. The Nairobi conference that followed in 1985 brought women from all over Africa together for the first time in history, said Robinson. The alternative forum there (Forum 85) forced a rethinking of the U.N. idea of women’s empowerment, she explained, leading the official conference to formally recognize that gender equality was not an isolated issue, but one that encompasses all areas of human activity. In Robinson’s view, the four U.N. Conferences on Women (1975, 1980, 1985 and 1995), together with the NGO forums that they gave rise to, built human capacity, developed networks and encouraged women to step into leadership roles. The last conference, held in Beijing, identified 12 critical areas for the advancement of women and metrics with which to measure progress. Mama Kiota’s educational work and the activities of the JND parallel the development of this global feminist movement, said Robinson. What these women are doing in Niger, she argued, is important. Moreover, it is something the global feminist movement can learn from. She noted, for example, that Mama Kiota’s daughter has criticized African feminists who argue that secular legal reform is the only viable paradigm for African women. Citing socio-cultural anthropologist Saba Mahmood’s concept of agency as the capacity to realize one’s own interests against the weight of custom, tradition, transcendental will or other obstacles, Robinson contended that both the global feminist approach to agency (via the 12 criteria identified at the 1995 Beijing conference) and the psychosocial approach to agency practiced by Mama Kiota and the women of the JND were equally valid for advancing women’s empowerment.